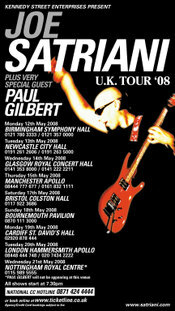 Paul Gilbert will open for Joe Satriani on a series of UK tour dates in May of next year. Dates and locations of the tour are below. Kudos to Truth In Shredding for spotting this news. All Satriani roads lead to Rome . . .
Joe Satriani is a wizard. He taught the mindblowing guitar virtuoso, Steve Vai, how to play key riffs. You can't go wrong if you see Jeff Beck, Joe Satriani or Steve Vai in concert. They enthrall their appreciative crowds. I think they're both fantastic, but in my opinion, Paul Gilbert is absolutely the best guitarist in the world. Technically, he is untouchable. He's also my second favourite. It'll be great to see two of my heroes play on the same night!